A gentle stroll through the lush gardens of our 4-star resort brings you to Batu Ferringhi beach. The calm waters and golden sands provide numerous opportunities for fun and adventure, the best of which are harnessed at our Watersports Centre. Qualified instructors can show you how to speed across the bay on a jet-ski, while families can experience the thrill of a banana boat ride. 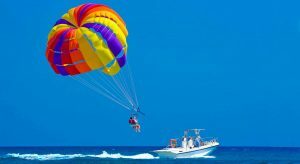 For the truly adventurous, parasailing lifts you high above the water to enjoy a bird’s-eye view of the Penang coast.